Cut and shoot your way through waves of enemies, taking there heads to gain their abilities! This was fun! Cute art and writing. Sprites for the player character and a couple of the guns. The beginnings of the player's death sequence. Now, instead of the player shooting towards the mouse, the player fires straight forward. This was due to the game being too easy before. I may re-implement this, as the game is a little dull now. Got some work done on the boss fight! The boss fires 50 bullets in a sweeping pattern, before reloading for two seconds, and firing again. I want some more attacks in there, but I'm happy with today's work! And also, my favourite bug of the day: Dying turns the player into an unstoppable ball of firey rage. Looks awesome so far, that UI is really classic! Another great video on "Juicing" your game is "The Art of Screenshake," with Jan Willem Nijman, he goes through the game step by step, there's some great stuff in there! Was pretty busy yesterday, so I didn't get anything done. Managed to get a little done today though! At 50 kills, the boss now appears at the top of the screen. A new enemy,that moves down the borders of the screen and fires a spread of 3 shots towards the middle. An extremely simple scrolling background, to aid with the illusion of movement. Tomorrow, going to focus on design and functionality of the enemies and the boss. Biker falls off bike, flying through the air for a short time before landing and sliding along the ground. The bike skids off, and if the bike collides with another biker, it explodes. The bike explodes immediately, with a Nuclear Throne-style screenshake. I'd like to do one more death animation, because it looks a little silly that most of the guys fly off their bikes. 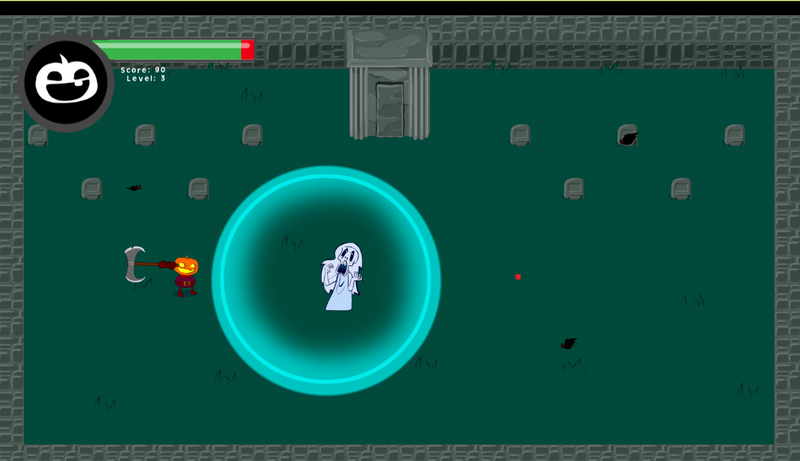 I also started implementing the boss fight, and a nifty little dust trail, that aids in the illusion of movement. I'd like to include a lot more stuff like this, smoke from explosions, bloody streaks on the ground when enemies die, etc. Tomorrow, going to focus on another enemy, and do some more work of the boss fight! I'm going to working on some artwork today, hopefully will have something to show tonight! Player movement, health and ammo. 3 guns: Pistol, machine gun and shotgun. 2 enemies: One non-agressive enemy that scrolls down, one that moves back and forth shooting in bursts. After finishing my game for the last jam (Get A Head, take a look!) I want to do more of what I did last time, but better! A functional and challenging boss fight. I'll be trying to update the devlog every night. Can't wait to read through everybody else's! Cute as hell, loved all the sound effects! Been pretty quiet on here for the past couple of days, because I've been wanting to get this semi - finished! And now I don't know what to do with my life. Download it here! This has been a great experience, but I think for my next game jam I'm going to have to make more of an effort to talk to the community, I focussed too much on the dev side and not enough on the social side. Thanks very much to cloudhime, lysnader and chitachita for organizing this, enjoy some screenshots! One more gif for the night: The fully functioning Gorgon head! Banshee sprites tomorrow! Getting there! Doing some more asset work. Dare you enter this spooOOOoooky crypt? Got some more art done today, and got my enemies spawning in waves! Taking a break from coding to get some sprites done! 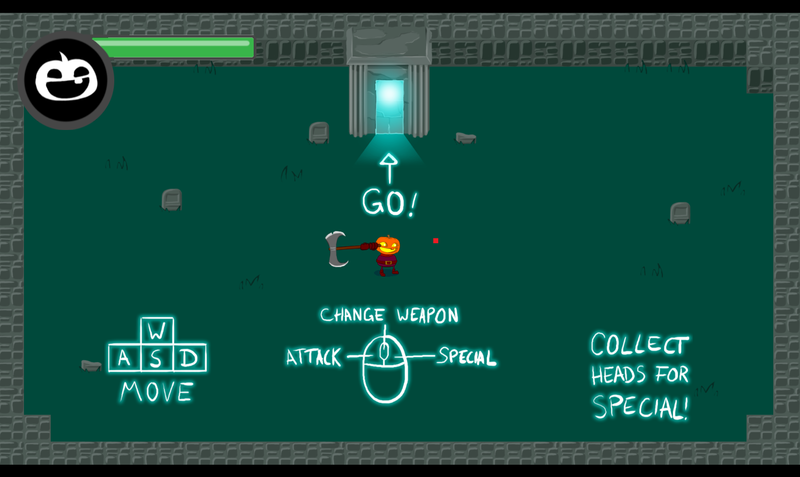 I've also managed to sort out the head - switching mechanic and special attacks! This looks cute as hell! I'm just about as amateur as they get, but I've been diddling about in GameMaker for a while now, so I thought it was time to test what I've learned. If you want to follow my work, I'll be posting here. I'm working on a game called "Get a Head," a small, one room top down shooter, drawing inspiration from The Binding of Isaac, Nuclear Throne and the Kirby games. 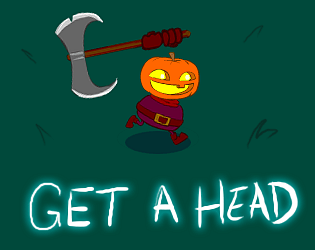 You play as a headless - horseman type character, armed with an axe and blunderbuss. You have to rack up a high score, surviving against waves of various enemies. Most enemies are generic imp things, that die quickly and attack in large numbers. However, some special enemies can be beheaded, and taking their head grants the player a special ability. Banshees stagger slowly around the arena, occasionally shrieking and knocking the player back. Taking a banshee's head gives the player this shrieking ability to keep enemies away. Snake-haired seductresses that freeze the player with their stares. Claiming their head allows the player to do the same. Strong, charging enemies that try to run the player down. 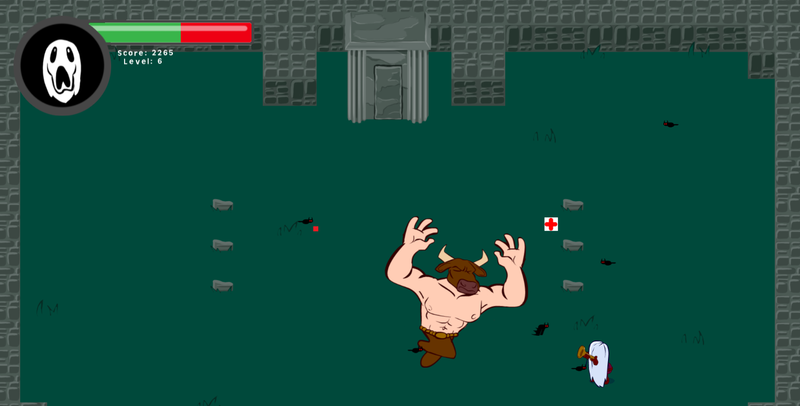 Taking it's head grants the player a dash attack. My goals were to complete a game, and hopefully make it fun to play. Can't wait to do some more work and see everybody else's entries! So far, I've got the player moving and attacking, as well as the imps, banshee and gorgon working (kind of), getting ready to implement the head - switching and more enemies. I'm always looking for critique, so please let me know if you have any suggestions or queries!